Kiersten that looks incredible! And naan shop…what a fun idea! Gorgeous images! My Mr is constantly urging me to open a naan restaurant with my creations. If I didn’t want to give up a personal life to spend all of my time at a restaurant, I would. I love how versatile that little flatbread is. Have you tried making your own? I haven’t ventured into that territory yet. I live here in Atlanta and have been meaning to try Naan Stop and yet always forget when trying to figure out where to grab food! This pizza looks great and super simple! It’s really good! Like Chipotle, for Indian food. 🙂 And they have 3 different vegetarian options–chola, dal, & paneer. I LOVE using naan for pizza crust! I love this! 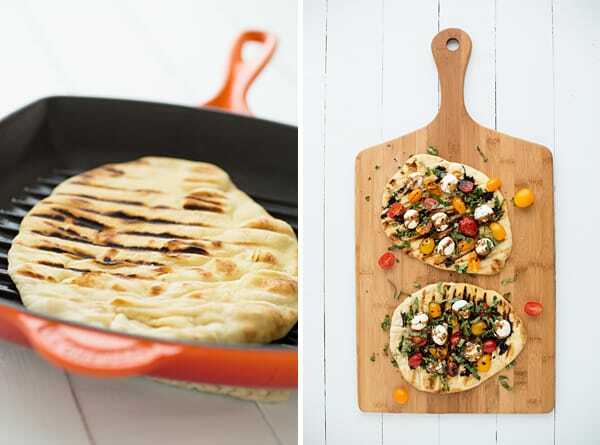 What a great idea for naan and an easy, fresh summer meal. Thanks for sharing! 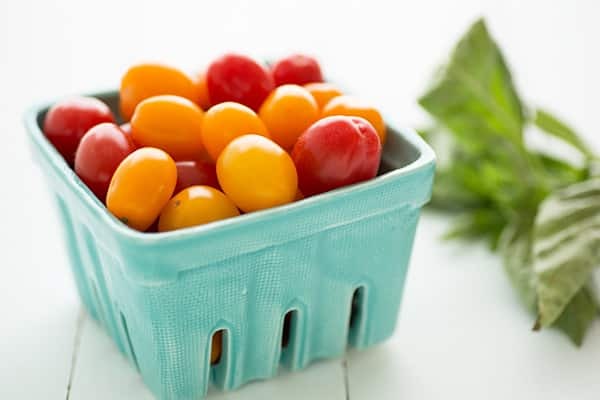 Your photos are gorgeous and caprese is my favorite salad – love to see it transformed into a pizza! I love using naan as a pizza crust! And your pizza is gorgeous – I love every single one of these toppings! Your picture appeared on my fb wall and I had to come over. It looks not only beautiful but also sooooo tempting. Naan is my new favorite bread/pizza crust/dipping tool too! I’ve also discovered that it’s the perfect panini bread. I love it for sandwiches! Pita bread is always so hit-or-miss when I buy it (and usually miss) that I mostly buy naan now. I love that you used naan as the crust! This looks so fresh and just screams summer! what a lovely pizza! love the idea of using naan as the pizza crust! I am not a big fan of tomatoes either. Some kid in kindergarden told me that the seeds were ‘fish eyes’ and I have never recovered from that comment…. Ha! That’s funny. 🙂 I like tomatoes when they’re cooked (most of the time), but they just don’t appeal to me raw. Your naan pizzas look incredible! 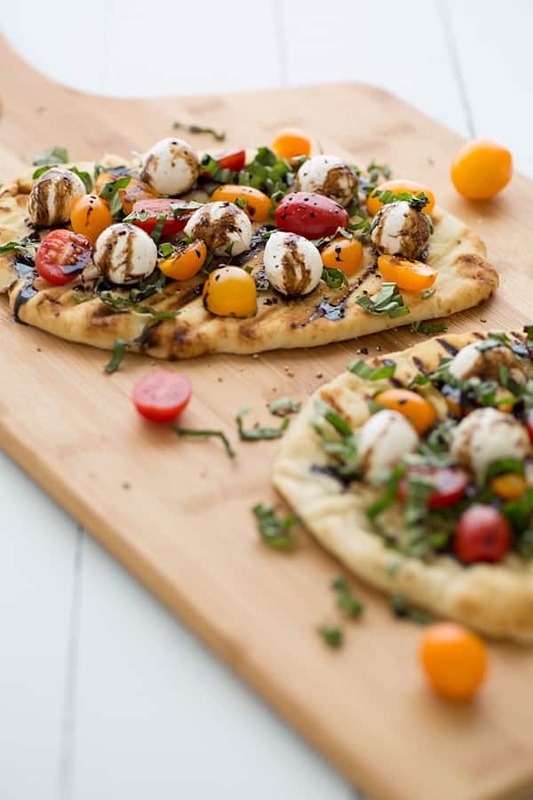 Balsamic Vinegar on mozzarella is something worth trying and the naan pizza is a fantastic idea! Beautiful pictures for a beautiful dish! Now I know what I want for dinner! So beautiful and colorful! I love this recipe. My goodness this looks so wonderful! I wish I had this for lunch today. My husband and I make naan pizzas all the time when we can’t figure out what to have for dinner! Yours look delicious! I totally agree – I haven’t bought pitas in ages but I buy naan all the time, it’s so versatile! Naan pizzas are one of my favourites; this version looks so fresh and light and perfect for summer! I haven’t had naan in such a long time! Thank you for the great recipe, this is perfect for summer! Well, I had never heard of naan restaurants, and now I must find one. This is perfect summer food!